The assassination of former Lebanese Prime Minister Hariri resurfaced on the front pages of major newspapers this week when the UN Security Council released a report that implicated Syria in his death. 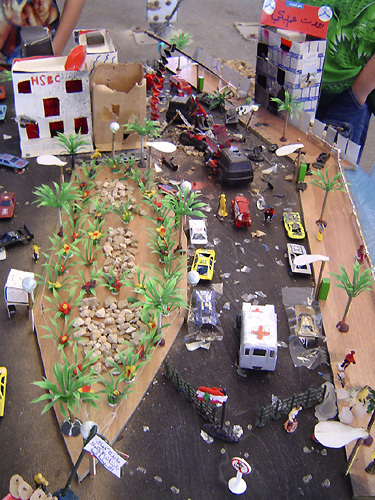 What had resurfaced as well from our archives is the following photo by Stephen Banham of a child's diorama of the Hariri car bomb site in Beirut. It is arguably one of the most remarkable images we've seen online. Check out the detail of the two toy cars in plastic bags. We're reminded of two things: 1) Landscape sketching. You take construction paper, scraps from your old models or pillagings from other people's models, whatever materials you can scrounge up, and using these garbage, you cut and glue a concept, a scheme and even a program together. You can even built it up to form the beginnings of a final 3D model. It's cheap and a speedy process in the beginning when you have so many ideas running through your head. Primitive rapid prototyping, if you will. In any case, you'll have a collage to donate for some future silent auction. And 2) Cancer Gardens or Healing Gardens, which some have called a “clash of nobility of purpose and banality of expression.” Or as we like to call it at Pruned, psychoneuroimmunobabblelogy. Or the tyranny of incomprehensible symbolics and methaphorics. Or the Las Vegas malignancy of landscape design. In other words, we're big fans. But are there enough scientific data on their physiological and psychological benefits to justify expenditures of public funds? We ask, since there seems to be a cheaper alternative, one with extensive field use, i.e., the simple act of drawing by kids after a traumatic event. Making diorama and landscape sketching would be the 3D version. Assignments: Post-Katrina Astro Dome. Post-Tsunami Banda Aceh village. Post-Earthquake Islamabad. Post-Fire Parisian Immigrant Apartment. Landscapes blow people into smithereens, but it can cure as well. i am doing the same thing for home work but my dioramas about a earthquake, how will i do it?